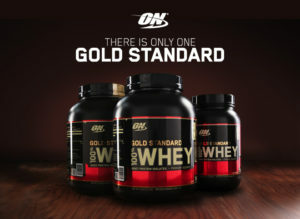 Optimum Nutrition is one of the leaders in protein supplements and Gold Standard 100% Whey certainly lives up to its name. Let us take a closer look at this product and rate a handful of categories on a scale from zero to 100 per cent. The worth of any protein powder is based directly around how easily it can be absorbed. As this mixture is primarily comprised of whey protein isolates, absorption is no longer an issue. This formula is also very easy on the stomach; a real concern for those who may have minor digestive issues. Five grams of branched-chain amino acids (BCAAs) per serving as well as four grams of glutamine provide users with extra muscle-building power when it is needed the most. 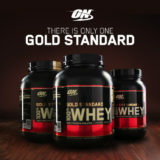 Gold Standard 100% whey is very easy to mix. This is not always the case with other generic brands. Not only will this powder instantaneously dissolve in milk, juice or water, but there are over 20 flavours currently available. So, even those with particular tastes will not be disappointed with what is in store. Much like the product itself, Optimum Nutrition has chosen a streamlined sense of packaging and branding. This allows users to quickly recognise it within any retail environment. The reverse side contains nutritional information as well as recommended daily dosage levels. We should note that serving sizes between one pound (0.45 kilogrammes) and ten pounds (4.5 kilogrammes) are available. Still, one must wonder if a bit more of a colourful splash would attract more consumers. A Good Value for Your Money? Most online retailers market a one-pound container at approximately $15 dollars (12 pounds). The largest size of ten pounds currently sells for $112 dollars (91 pounds). This roughly breaks down to two pounds per serving. While this price is considered to be competitive, it is not as low as some other major competitors. However, we can see this as a trade-off considering the high-quality protein that the user can enjoy. Gold Standard 100% Whey protein is certainly one of the best choices for those looking to build muscle while cutting down on their fat intake. The sheer variety of flavours and sizes further add to the superior nature of this product.